It was reported earlier this week (beg01Jan17) that sales to see Taylor perform live were not doing well in the wake of the various scandals the star has weathered over the past year. However, these claims were dismissed as Billboard got their hands on sales data from sources close to the singer, which showed that she is having no trouble offloading tickets to her shows. Billboard reports that the $180 million came from four days of verified fan pre-sales, and three days of public sales. And while none of the shows have yet sold out, this is something Taylor's team have anticipated. 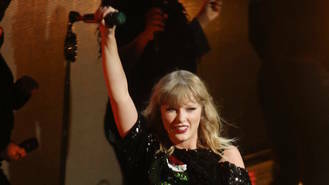 After the huge demand for tickets for her last tour, which lead to millions of tickets being snapped up by touts and sold on at a higher cost, Taylor and her team are using the slow-ticketing method for the Reputation Stadium Tour. This means that tickets are priced higher than for her previous tours, to discourage touts, and many fans have been given their own "slots" at which point they are able to purchase the tour tickets. And of using this method, David Marcus, executive VP and head of music at Ticketmaster, which is working with Taylor on the new ticketing system, told Billboard: "We'd like to sell the last ticket to her concert when she takes the stage each night. We're not trying to sell all of her tickets in one minute; we're trying to figure out how to sell tickets in a more modern way." According to Billboard, if ticket sales continue at this pace, Taylor's Reputation Stadium Tour has the potential to earn a staggering $450 million (£331 million) - which would make it one of the highest-grossing tours of all time. The Reputation Stadium Tour kicks off on 8 May (18) in Glendale, Arizona.